Yesterday I finally got the chance to climb up on the telescope, to see the mirror up close. Ostensibly I went up there to brush some snow off before we start doing observing tests, but really I just wanted to see. 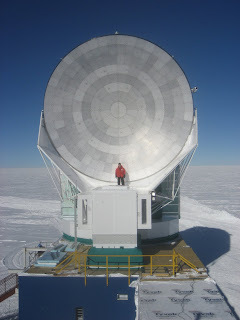 Yep, that’s me in the red coat standing right in front of the 10-meter diameter SPT primary mirror. The mirror is made of many small panels, each about 3feet or so “square”. Each panel was machined from aluminum, using a very precise milling machine (ie, cut with a sharp tool). All the panel surfaces are aligned to within about 40 microns of the desired surface; that’s about the width of a human hair. Here’s some video of the route up there, filmed by Abby standing on the roof of the “Dark Sector Lab” building right next to the SPT. This is wonderful – the department has got to know about this and the first step will be to post the picture on the second-floor bulletin board!Signed – one of your many fans!